There was a time when I just didn't get marigolds. I saw them being sold at plant centers by the thousands and wondered "who on earth buys these boring flowers?" 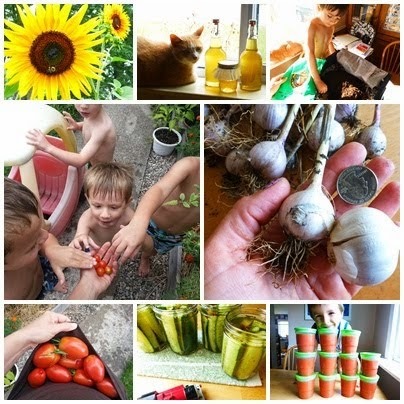 Specifically, I began organic gardening. One of the first things I learned as I began growing food is that marigolds are a must-have. The marigold is described as a workhorse in the garden, driving away pests like aphids and cabbage worms and rabbits. Though some will claim that the miracles of the marigold are overstated, I know many gardeners who have sworn by these beauties for years. I no longer see them as boring, I see them as incredible in their simple beauty, and I'll include them for as long as I garden. They are very easy to grow, either transplanted or from seed. They come in a stunning variety of shapes and colors, adding gorgeous splashes of red, yellow, and orange to the garden. They release compounds that destroy nematodes that feast on and destroy root systems. Their pungent odor has been said to keep deer and bunnies at bay. Some people swear that planting them by tomatoes improves the flavor of the tomatoes. My grandma planted a marigold by each of her tomato plants religiously. They are edible! Some varieties taste better than others; Lemon Gem, other Gem varieties, Mexican, and Signet are popular edible choices. Grow those and you can pick off a flower or two for your salad or chopped and cooked into rice. They bloom continuously. All spring, summer, and into fall, marigolds put out new blooms. You'll have beautiful swatches of color all season long. They are wonderful for bees and other pollinators. 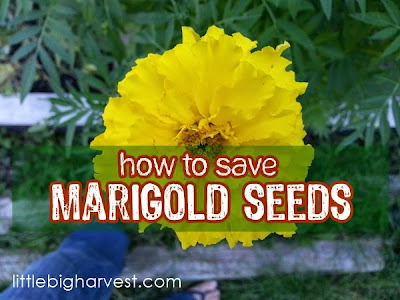 Once you realize how simple it is to save marigold seeds, you will never buy another packet again (unless you want to add another variety to your stash, of course!). It's so simple, there is no reason NOT to. You'll have thousands of seeds with very little effort, and will have ample marigolds every single year. Throughout the season, but mostly in the fall, the marigold flower heads will shrivel up and dry out while still on the plant. Simply pull off these dead head and allow them to completely dry indoors. Toss them all in a jar to store through the winter, and in the spring you'll have more marigold seeds than you could possibly use. I take the dried flower heads out in the spring when the threat of frost is gone, and I sprinkle them generously all over where I want marigolds. Not all of them will germinate, but a ton of them will! this will give me hundreds of seeds for the next season. When ready to plant, it's simple. Peel away any of the dead petals and you will see the seeds. The seeds pull out easily. I simply scatter them all over the beds I want marigolds to grow.